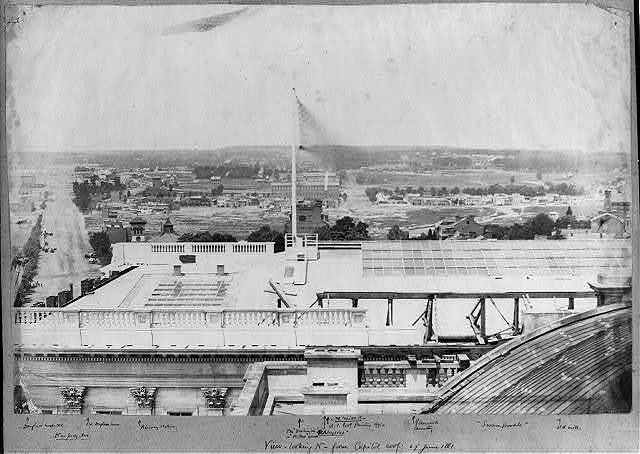 Not many of us get to see Washington, DC from the roof of the Capitol. None of us ever got to see the view in 1861, but here’s the next best thing. Taken in 1861, this is looking north. The cursive at the bottom is pointing out the different sites you can see. From left to right they read: Douglas Hospital, Old Douglas House, Railway Station, The Washington (or Wilkes House), St. Aloysius, Government Printing Office, Glenwood Cemetery, Swampoodle, and Old Mill. We particularly like the ghostly, blurred waving American flag in the center. NOTE: This was posted a while ago, but it was so good that we had to post it again.